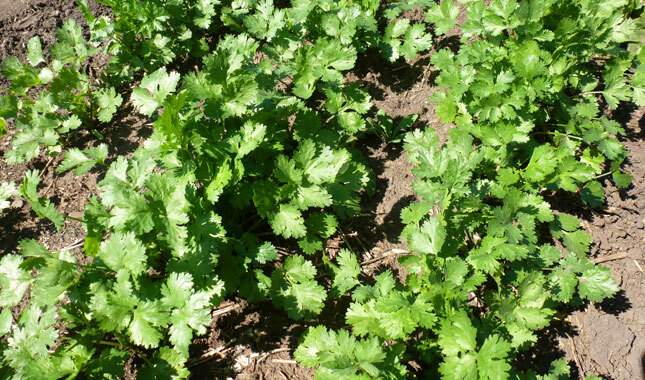 Cilantro (foliage), which matures into coriander (seed), is easy to grow, and will reseed under good conditions. Each round fruit contains two seeds which, if they both sprout, may require thinning. Sow seed 1 cm (0.4 in) deep and thin to 20 cm (8 in) in early spring. Seeds can take between 2 - 3 weeks to germinate. Harvest cilantro leaves leaving some on the plant. Once the edible flowers develop, plants will stop making more leaves and put all of its energy into making seed. Allow some plants to go to seed for coriander seeds. Plant again in early August for a fall harvest of fresh cilantro. Ensure the tan coloured fruit/coriander are fully dried before sealing up for spice or next years' seed.